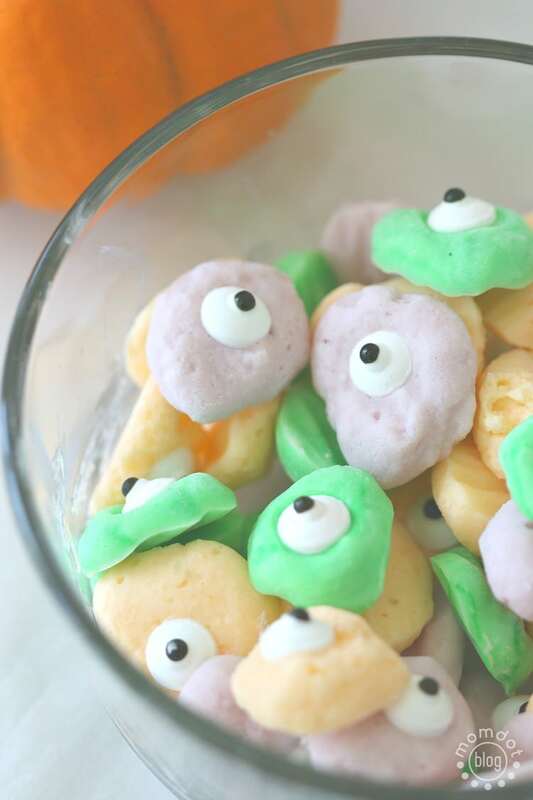 It’s fall time and you know what that means- taking your favorite snacks and making them even more fun. I am here to show you a really simple recipe hack that will make your kids giggle up a storm. Even better, they can help put this one together with very little supervision (mom’s favorite words)! Now we are already big fans of Yoplait Greek 100 Yogurt around here. There are so many flavors that satisfy the needs of both kids picky tastes and at only 100 calories, you can toss the guilt out the window. 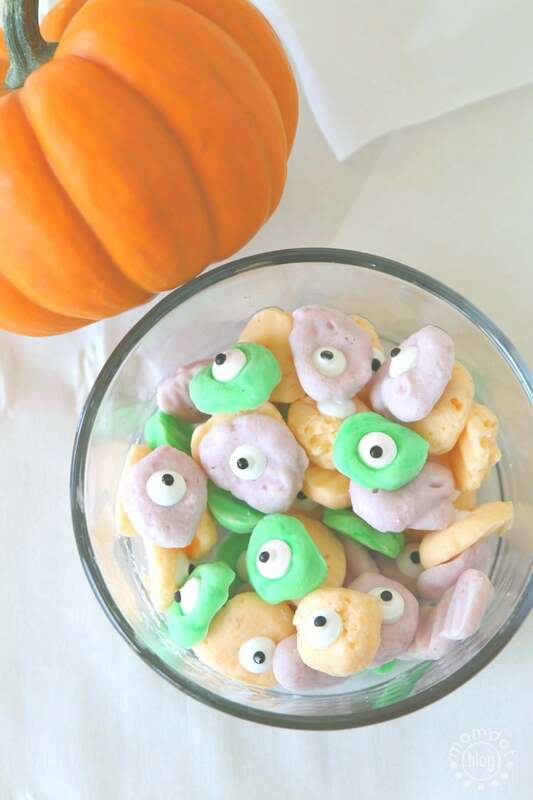 Create frozen Yogurt eyeball bites with only two ingredients. Simply spoon your yogurt into a tiny snack baggie. Clip the end and squeeze your yogurt to the bottom. Slowly squeeze out into bite sized yogurt bites on a piece of parchment paper. 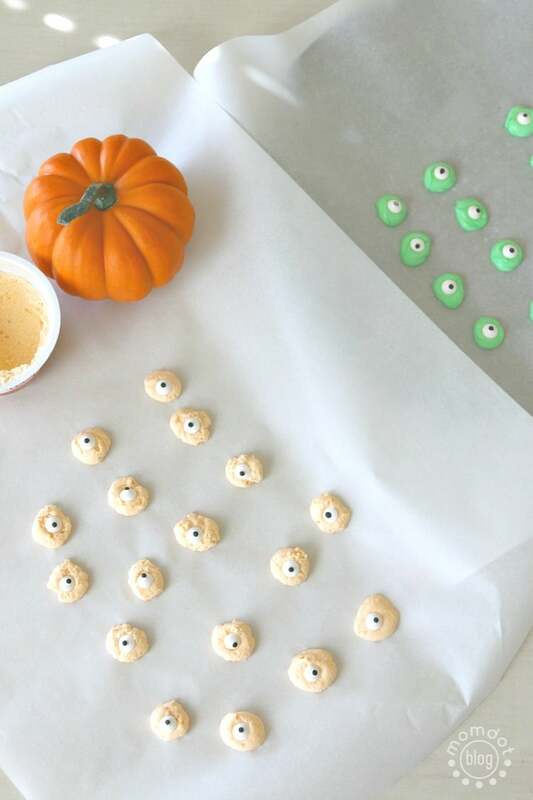 Once done, set your mini candy eyeballs in the middle. Stick your parchment paper in the freezer for approx 30 minutes. Pull out and peel off! Serve immediately. Note: Your mini eyeball yogurt bites will float, so throw a few in a glass of green juice for the kids. Just note that if they are too small they will flip over, so make your bites larger than eyeball size if you plan in putting in a glass. And while the kids love this fun Halloween snack, well, I like to eat it the old-fashioned way- with a spoon. Now once you make these you may get addicted and yes, in the off season it’s easy to leave the eyeballs out for a great afternoon or after school snack as well. You can pick up your Yoplait Greek 100 Whips, Yoplait Light and other Yoplait varieties at your local Walmart for just $1!